Cheyenne and Denver share a unique history in their respective InterOcean Hotels. Both hotels were owned by African-American Barney L. Ford. Ford was born a slave in 1822 in Virginia. He was the son of the plantation owner and a slave named Phoebe. Ford learned to read and write and was hired out to work on a riverboat on the Mississippi as a teen. He escaped at age 26 via the Underground Railroad. In Chicago, he adopted the middle name Lancelot and became a barber. He married Julia Lyoni in 1849 and the couple headed to California in 1851, seeking gold. Traveling by ship, the debarked at Nicaragua and opened a hotel and restaurant. The business was destroyed during a civil war and the Fords returned to Chicago where they ran a livery and assisted other runaway slaves as part of the Underground Railroad. In 1860, they headed to the Colorado gold fields but were unable to file a claim because of his race. Instead, Ford owned a barbershop, restaurant, and the two Inter-Ocean Hotels. Barney Ford opened Denver’s Inter-Ocean Hotel in 1873. It was located at the corner of 16th and Blake Streets. The Rocky Mountain News proclaimed it “the finest in the territory and the best appointed hotel west of Saint Louis.” The hotel featured a black walnut key rack behind its semi-circular front desk. Other appointments included bronze chandeliers, satin-trimmed velvet draperies, and lace curtains. It also had a modern electric annunciator with “wires to every room” and “speaking tubes on every floor.” Capped with a mansard roof, the building was a shining example of Second Empire style architecture. 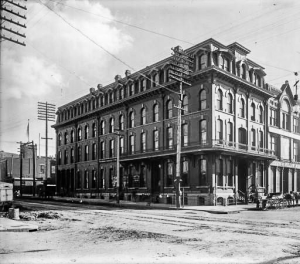 Ford opened the Cheyenne Inter-Ocean Hotel in 1875, on the corner of 16th Street and Capitol Avenue. The three-story building was considered the premier hotel in the city and a well-known social spot. Arched windows, balconies, cornices, and brackets graced the façade. Among the first hotels in the U.S. to have electric lights, it was a popular destination and served at the starting point for t he Cheyenne-Deadwood Stage Line. Guests included Teddy Roosevelt, Ulysses S. Grant, and Sarah Bernhardt. They arrest of Tom Horn occurred in the hotel. The dining room featured wild game: on opening night, the menu included twenty entrees and fifty desserts. Ford returned to Denver when the hotel became unprofitable. The Denver Inter-Ocean was sold to John Wesley Smith in 1876. Smith owned the American House, located diagonally opposite the Inter-Ocean. Three years later, the Windsor Hotel opened nearby and took over as the city’s premier hotel. Over the years, the Inter-Ocean declined in popularity and eventually became a low rent hotel for transients. It was razed in 1973 and the site became a parking lot. The Cheyenne hotel was gutted by fired on a cold winter night in 1916. It was never rebuilt. By the time Barney Ford opened his two Inter-Ocean Hotels, he was already well-known to Coloradoans. His People’s Restaurant, established shortly after his arrival in Denver in the 1860s, was located at 1514 Blake Street. The building still stands and, today, is known as the Barney L. Ford Building. Though an excellent businessman, Ford was also a champion for African-American rights. He traveled to Washington, D.C. in 1865 to lobby against Colorado statehood because the proposed Colorado constitution barred African-Americans from voting. He also campaigned for the Fifteenth Amendment to the U.S. Constitution, passed in 1870. 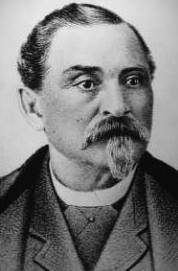 With African-American suffrage guaranteed, he shifted his support for Colorado statehood (gained in 1876). By the 1870s, Ford was one of the wealthiest men in Colorado. He was made a member of the Colorado Black Hall of Fame, the Colorado Business Hall of Fame, and founded a school for African-Americans with his friend, Henry Wagnoner. He was honored with a stained-glass window in the State Capitol building and a Denver elementary school bears his name. In 1882, Ford moved his family to Breckenridge. The home they built and occupied has now been restored as the Barney Ford House Museum. The Breckenridge hill where Ford staked his mining claim (vacated because he was African-American) is now known as Barney Ford Hill. The Fords returned to Denver in 1890 and Barney died there in 1902.